Y’all know RancherMan & I like to make our Christmas gifts ourselves. To us, it’s just so much more personal. Plus by doing so we’ve removed ourselves from the consumerism and stressful side of the holiday. We feel it’s brought us back to a more well-balanced Christmas filled with the love of Christ & the warmth of family & friends. Sure it takes more time (and sometimes more money too) but we feel we’re living our values, and that’s important to us. You can see a few of the homemade gifts we’ve made in the past here. This year we’ll be giving experience gifts to our grandchildren. We’re taking them to a live production of “It’s a Wonderful Life”, performed in a vintage 1940’s theater – how fun! But we still want them to have something to open during our family Christmas celebration too. So we decided to make pocket hand warmers for each of them to keep their little handsies warm during the chill of winter. Their parents need only to pop these little warmers in the microwave for a few seconds. The grandbabies then would be able to tuck the heated hand warmers into their jacket pockets. These pocket warmers should stay toasty for about 30 minutes, perfect for walking to the bus stop or heading out to play on a chilly day. So now that we’ve decided on a project, there are still decisions to be made. Like what kind of fabric should I use, what shall I fill them with, and should I scent them? I thought about flannel or fleece material for their soft fluffiness qualities. I also thought about felt that was sewn rustically with contrasting-colored embroidery thread. But in the end, I decided to repurpose the denim from RancherMan’s old worn jeans. I love that soft, durable material. 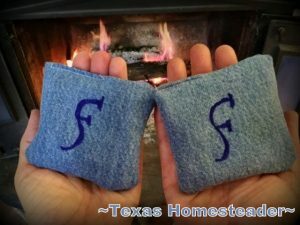 Plus that way our grandson can feel comfortable carrying these hand warmers in his pockets because denim is plenty manly alright! NOTE: I often have these delightful hand warmers for sale in my online store! For those of you asking about my Online Store Here, feel free to check it out! So several days in advance I poured some long-grain rice into a container and added about 10 drops each of lavender, lemon and peppermint essential oils. Then I stirred the rice and closed the container to let the rice take on that delightful aroma. But now it’s time to make those hand warmers! I decided for my hand warmers I’d want to cut the fabric into 4″ x 8″. That way I could fold them over and only sew 3 sides. Plus the finished size would be about 4″x4″, less the seam of course. Seems about the perfect size for our grandbabies’ hands! 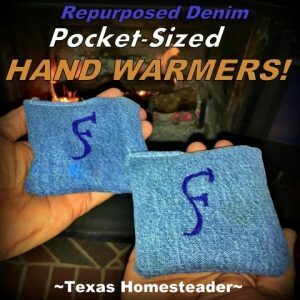 First I wanted to experiment by making a pair of hand warmers for myself. I figured if there was a learning curve I’d want the mistakes to be made on mine, not one of our grandkids’ gift. So RancherMan dealt with ironing/measuring/cutting the repurposed denim. Then he handed the pair of 4″x8″ fabric pieces to me. 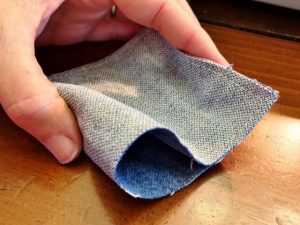 I pinned them right-sides together and sewed a small 1/4″ seam along the edges, leaving about 1.5″ at the end to fill the hand warmer. Using the rounded end of a metal kabob I pushed the inside of the hand warmer through the hole I left. So the right sides are now facing out. I’m left with a sewn square with a small 1.5″ opening. Then I popped a funnel into that small hole. I scooped up 1/2 cup of scented long-grain rice and poured it into my hand-warmer. Then I tucked the unsewn edges inside, pinned them together and back to the sewing machine. I sewed that tiny section shut and VOILA! I copied those steps for the second hand warmer so I’d have a pair. But what to use to make the personalization? Well, I have a brand new blue Sharpie permanent marker pen so I drew our ranch brand on my pair of hand warmers. I mean, heck – it’s a PERMANENT marker so why not? There, all done. Now let’s step back & evaluate. What do I think? Hummm… I think I like it! I plunked them into the microwave for about 20 seconds and they were pleasantly warm but not hot enough to burn. IMPORTANT: microwaves vary & you don’t want to burn little hands! A little bit not hot enough is MUCH better than a little bit too hot! OK, I think I’m ready to start making the grandbabies’ gifts! Remember, when RancherMan & I make our Christmas gifts we both have a hand in it. Whether cooking and canning edible goodies, making homemade soap, or any of the other homemade gifts we’ve made over the years – we do it together! So RancherMan took over the fabric duties again. First he cut long swaths from the leg of the denim and ironed it smooth. Then he a made a 4″x8″ cardboard template and started marking the fabric with a pen. After it was marked he attempted to use a pair of scissors to cut the fabric into pieces. But the denim is so thick that this step was a little bit of a chore for him. Then I remembered that we had these *Black & Decker electric scissors. I love these things! I charged them up & told RancherMan to give ’em a try. He swapped out the manual scissors for the electric ones and was amazed! They cut through the fabric like butter – all he had to do was push the button & guide the scissors. 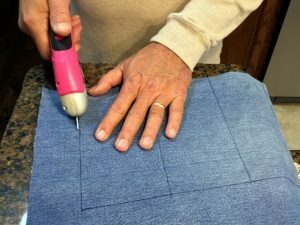 He exclaimed “Dang, this is like a power saw for fabric!” LOL Using these electric scissors he made a pair of fabric pieces for each grandchild in record time. Soon he had all the fabric cut and he brought them to me. Now it’s my turn to have a hand in these gifts. While I’m sewing the hand warmers I asked him to look up some cool fonts to personalize them. Oh, but that’s when the quick part of this craft ended. I was at the sewing machine All. Day. Long. It’s not because this project was hard or complicated. It was all user error! I’m not a seamstress y’all, not even a little bit. Every little task took me 3x as long as it should. Then there was the comedy of errors that took place one by one. The thread spool ran out, the bobbin ran out of thread, the needle came unthreaded (a lot), seams had to be resewn, etc. Most of these things required me looking through the sewing machine manual to find out how to reload the bobbin, how to re-thread the needle, etc. I think this perseverance is a strong testament to my undying love for those little waifs. LOL. But at last the pocket warmers were all finally sewn. Now I want to personalize them. I asked RancherMan what fonts he’d come up with and he showed me what he thought would look cool. 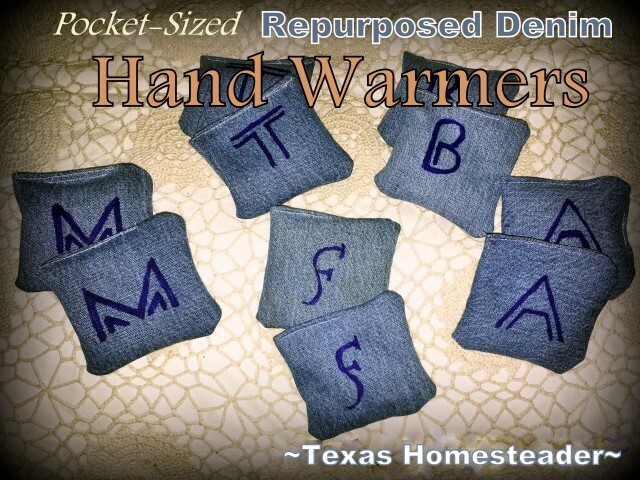 We decided on a font & I used my blue permanent marker and drew their first initial on each pair of hand warmers. I think they turned out super cute! Although I’ll admit they’re fully imperfect due to my mad seamstress skills (or my seamstress skills that make me MAD). But I still love the way they turned out. They’ll offer each of our precious grandbabies the warmth of their grandparent’s love on a cold day. To Use: Microwave to heat for about 20-30 seconds (depending upon the power of your microwave. Test to make sure they’re not too hot!) Then they can be tucked into coat pockets and should stay warm about 30 minutes before needing to be reheated again. This entry was posted in Blog Posts and tagged Christmas, Environment, Frugality, Holidays, Make-It-Yourself on December 11, 2016 by Texas Homesteader. These are great! I have a huge one that is more like a heating pad, but I wouldnt have though to make them hand sized. Thanks for sharing on the Waste Less Wednesday Blog Hop! A great idea! I have some, but bigger ones and I really like the pocket size style!! Thank you for sharing at Sweet Inspiration this week!! Well done Tammy. I used to make these years ago and even made a long one to keep by toes warm at night as I’m always getting cold feet. By making longer ones, they work great for keeping out drafts from under doors, window seals, etc. Besides using rice, you can also use dry corn or flaxseed of which flaxseed will stay warmer the longest. They are fantastic for muscle aches, and icy cold toes at night. You can also put them in the freezer for cold packs as well. Suggestion:; Always keep extra machine needles on hand and making sure to use right weight needle for fabric using. Also, when you have to rethread a bobbin, do 2 right away; especially with the colored thread you use most often. When one runs out you have a back-up already threaded and handy. I Always see to it that I have 2 white threaded bobbins, 2 black and 2 dark blue, as that is what I use the most of. It saves time when you don’t have to stop in the middle of project to rethread a bobbin. I gotta tell you a rather funny story about what happened to a friend of mine who made; well tried to make some of these hand warmers. This happened some years ago. I had sent her a couple of hand warmers and she wanted to make some herself so she called me wondering how to make them so I told her and gave her the instructions over the phone. She asked what to fill them with, at which time I told her rice, corn or flaxseed. After she quickly made hers and put them in the microwave she quickly called me back and told me that they where’ popping.’ ( I think you know where I’m going from here.) I asked her what she used, and she said; “popcorn cause she didn’t have rice or flaxseed on hand.” So folks, Do Not use popcorn when making these unless you want to eat your finished warmers. :} We both had a good laugh about it afterwards.